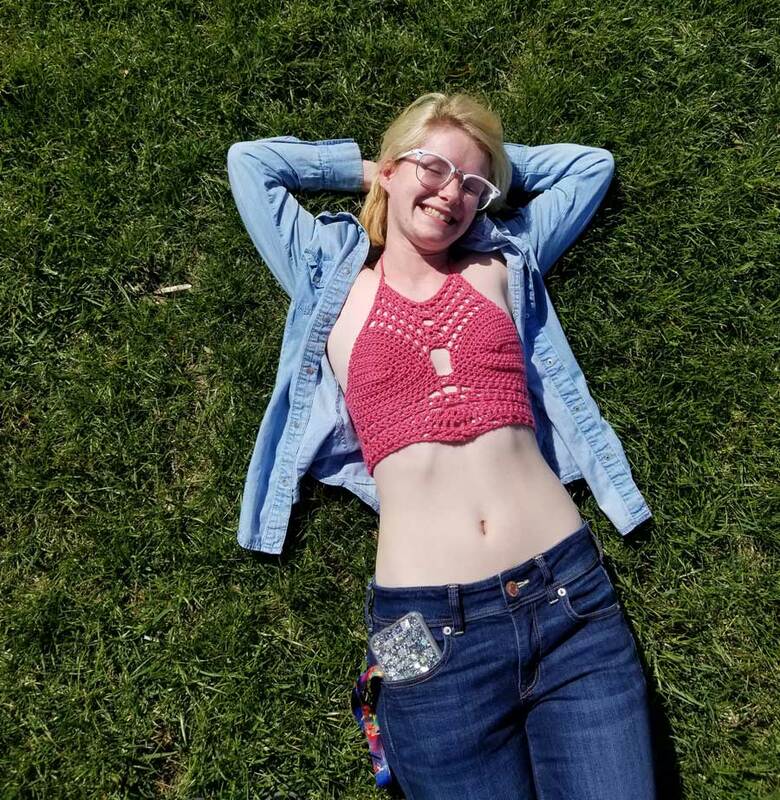 De is a senior in college who is combining her love of art and design with her love of crochet. As an artist she is always pushing her boundaries and seeing where she can go with crochet and other media. 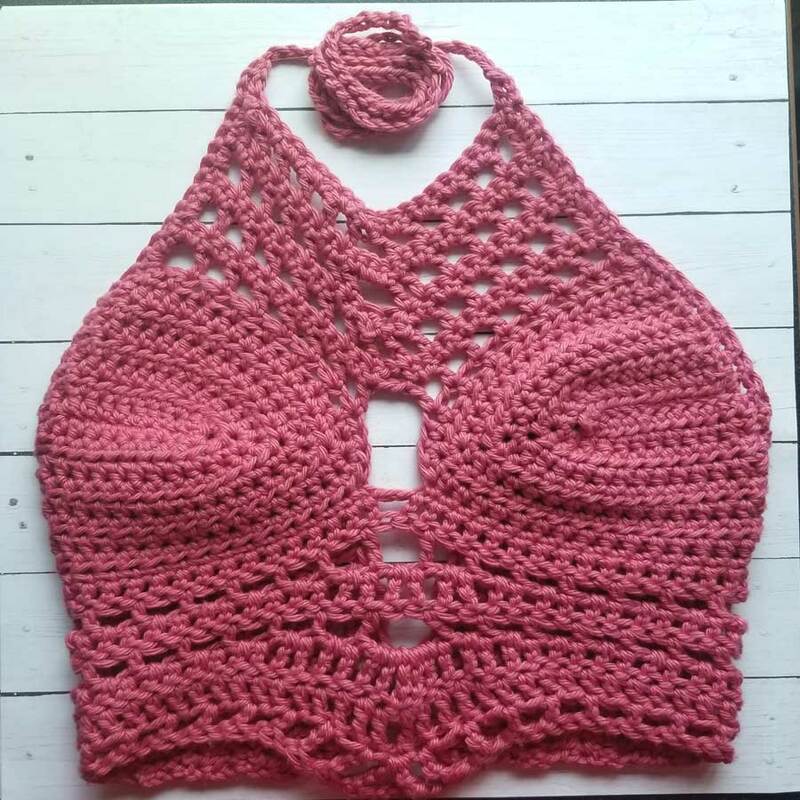 She loves to hula hoop and this hobby has pushed her into designing tops as there was a need in the community for comfortable, natural fibre clothing for other artists to flow in. Hi guys! 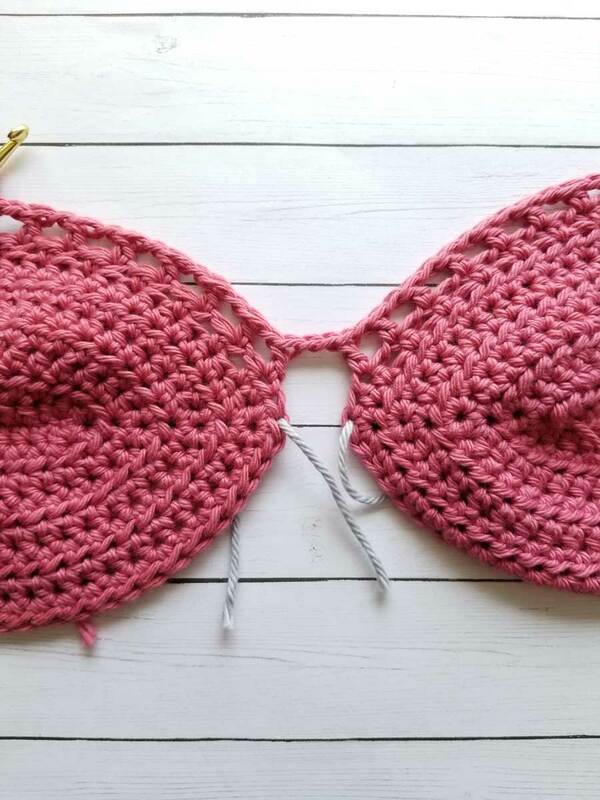 My name is De, I’m a crochet wear designer in Fort Wayne, Indiana. I’m the maker behind Knotty Bliss Boutique and I started this journey of making things when I was a child, but started designing last year. I try to tie in my art and my crochet work because it makes for a fun mixed media project, but I love being able to wear the things I make too and that got me into designing really because I struggled to find patterns I actually wanted to wear. This is the Calypso Bralette, a fun top with a corset style back. The idea came to me one night and I stayed up to make it because I didn’t want to lose the idea if I went to bed. A couple hours later and I had a finished top and a written pattern, but it was so worth it for the finished product. 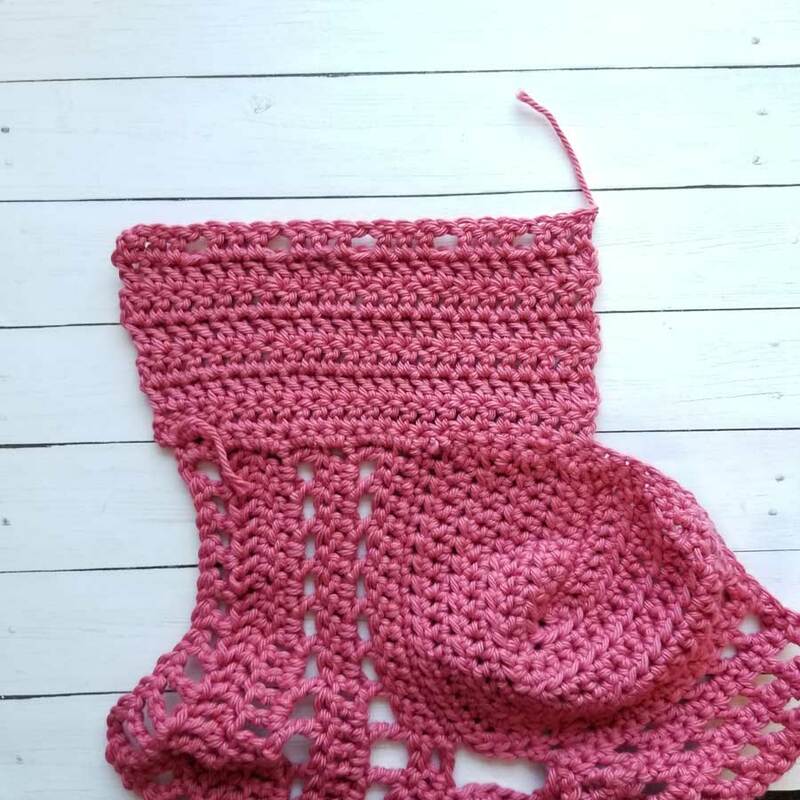 I hope you enjoy this pattern and make lots in various colors! Small- 5-5.5 inches wide after 8 rows, Medium- 6-6.5 inches wide after 10 rows, Large- 7-7.5 inches wide after 13 rows. 2 rows DC should be 1 inch tall. Pattern Time! 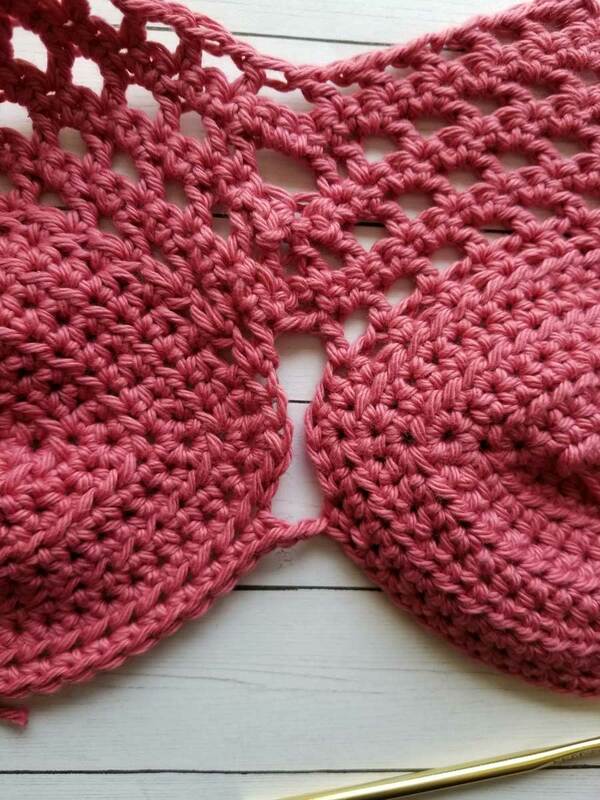 I’m making this top with the color Rosey II, a pretty dusty rose color. To start off you’re going to make 2 cups from the following. Don’t worry, your cups are supposed to round, not stay flat. Size Small continue to row 8. Rows 8 (35) & 9 (37): Repeat row 7. Row 9 (11, 14): CH 1, SC across bottom of cup evenly. Small should be about 15 SC, Medium should be about 20 SC, Large should be about 25 SC. Fasten off. Make 2nd cup. But do not fasten off at the end. 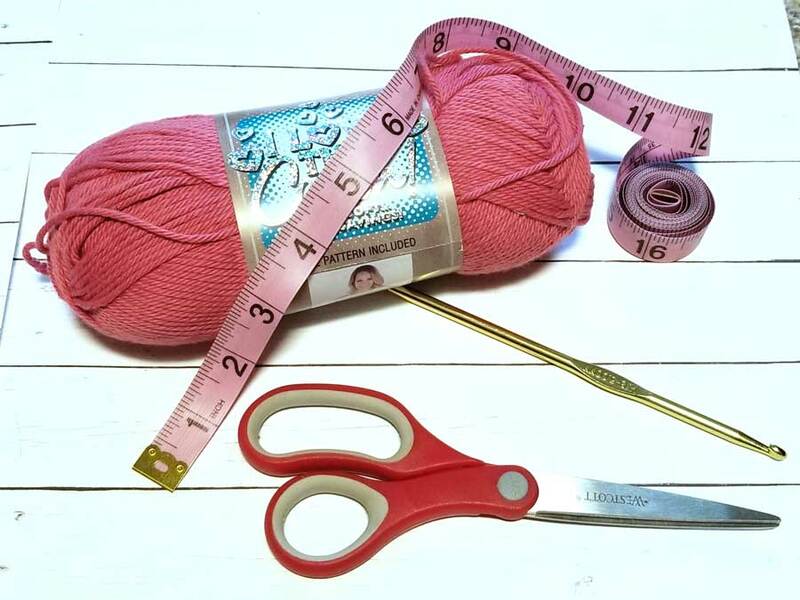 *Each Cup should measure about 5-5.5 inches wide for a small, about 6-6.5 inches wide for a medium, and about 7-7.5 inches wide for a large. Next we’re going to connect the cups. They will be connected by some DC’s that go from one to the other. Now for the bottom half of the top. This is the part of this top I love the most because it is a little longer than most crop tops of this style and it gives a little flair. 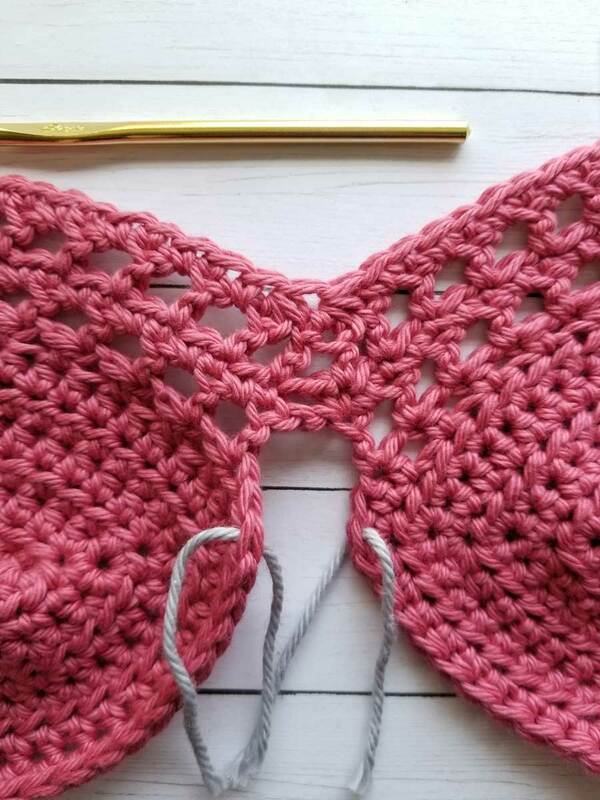 Attach your yarn to a corner on one of the cups. Do not fasten off after you finish row 8. You’ll continue onto the outside border. CH 1, SC evenly around, going up the side, across the top, and down the other side. A small size should have 40 SC on each side. Medium should have about 47 SC on each side. Large should have about 53 SC on each side. Fasten off. Now that you have the front of the top done, you just need to do the ties and back and you’re all done! 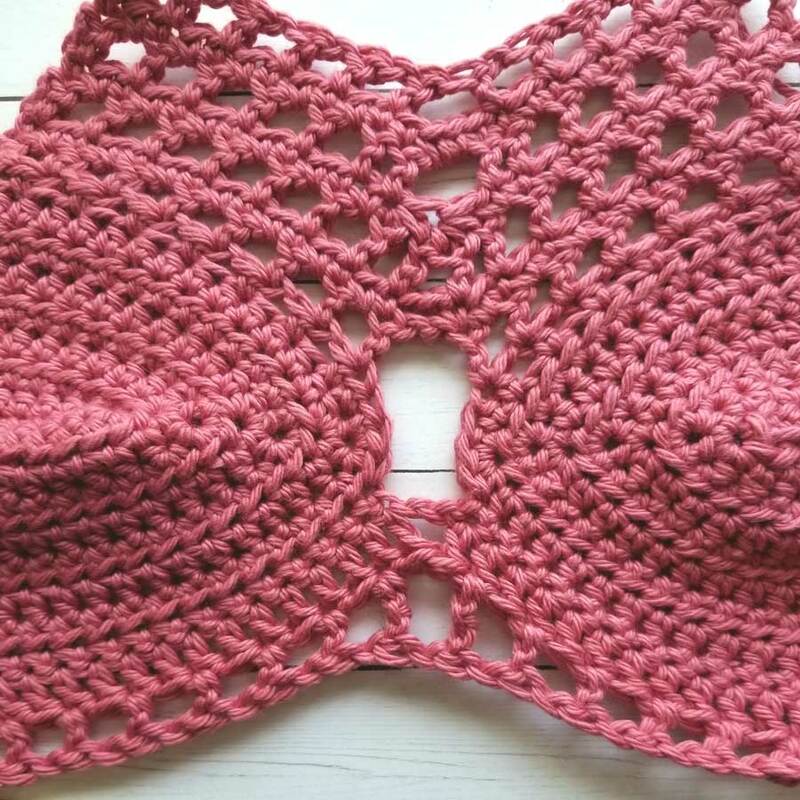 For this top I decided on a corset style back because I thought it would bring the entire top together instead of the normal ties that you see on crochet crop tops. 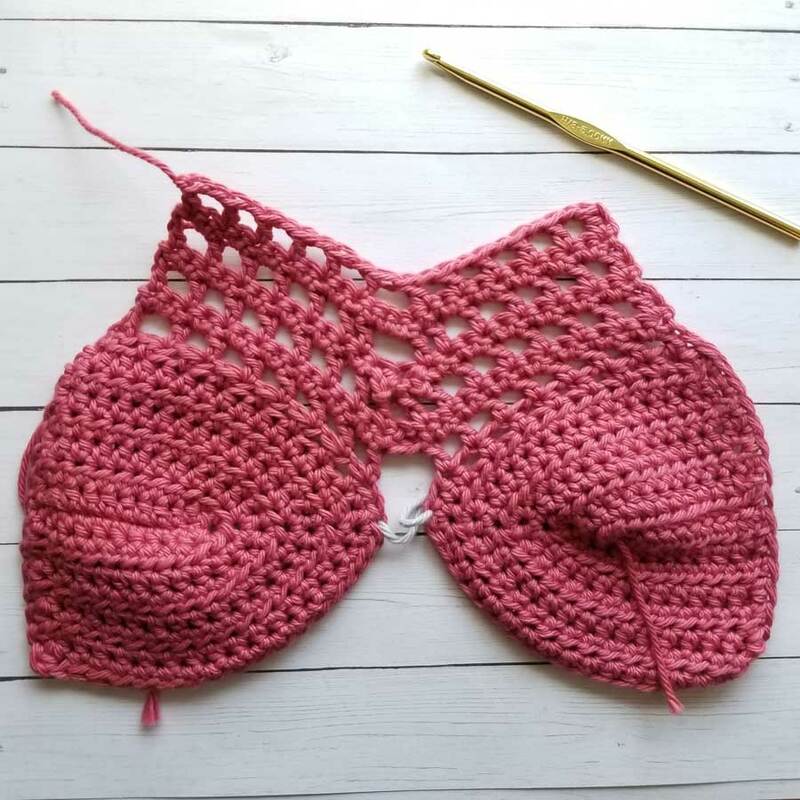 It’ll let you add a little flair as you can use ribbon, yarn, whatever material you want really to tie the back when you wear it! Now repeat on the other side! For the neck ties You’ll want to attach yarn to last side stitch from the border. CH 2, DC in next ST, CH 50, Fasten off. Repeat on other side. Weave in your ends and you’re all done! I hope you love this top as much as I do. It is one I will wear a good portion of the summer if I’m not working. I would love to see your creations on Instagram! 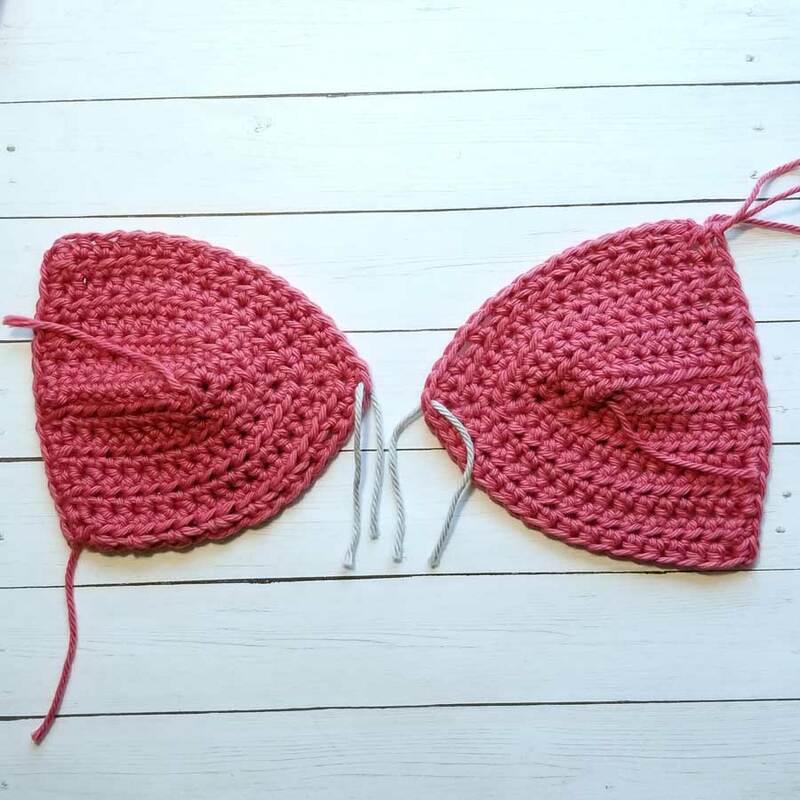 Feel free to hashtag your progress photos or finished items with #knottyblissboutique, #calypsobralette or tag me @knottyblissboutique. Be sure to also check out my Etsy shop for my other patterns!